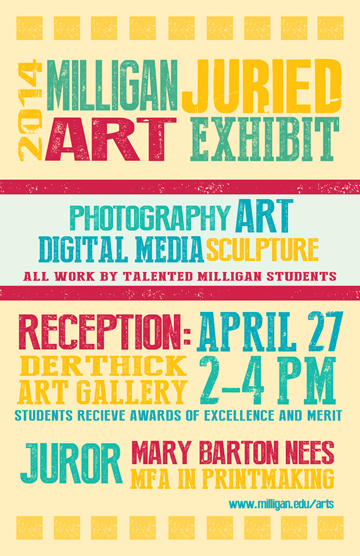 MILLIGAN COLLEGE, TN (April 22, 2014) — The 19th Annual Milligan College Juried Art Exhibition will be on display April 27 to May 2, in the Milligan Art Gallery, located in the lower level of Derthick Hall. There will be an opening reception on Sunday, April 27, from 2 to 4 p.m. The exhibit and reception are free and open to the public. 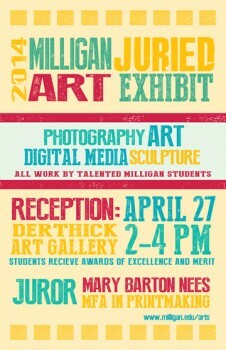 This exhibit showcases the top Milligan student art projects from the year. Only the best art, photography, sculpture and digital media projects will be selected for display. Awards of excellence and merit will be given to standout pieces. “This is an excellent opportunity for the Milligan students to have their work critiqued by someone in the local community,” said Alice Anthony, associate professor of art at Milligan. The juror is Mary Barton Nees, an adjunct member of the art and design faculty at East Tennessee State University. She was trained at Cornell University (Ithaca, N.Y.), the Pennsylvania Academy of Fine Arts (Philadelphia, Pa.), and the Barnes Foundation (Merion Station, Pa.) before earning her Master of Fine Arts in printmaking from ETSU. “I consider art as language, a response to what we are handling right in front of us,” said Nees. She works with various media such as monotypes with mixed media, gestural landscapes using Chinese inks, watercolor or cold wax. She serves as a member of Christians in the Visual Arts (CIVA) and currently has a traveling exhibit in the United States called “Scribes of Hope II” juried by Timothy Botts. In 2006, Nees was invited to conduct a workshop and lecture the student body at the Luxun Academy of Fine Arts in Shenyang, China. She also has done several lectures at the College of International Business of Shenyang University. In addition, Nees recently won third place in the Appalachian Art show and maintains a local studio. Posted by tommy on April 22, 2014.